Today, I thought I would share some of the products I have used down to the last drop over the past few months. I have been through a wide-range of products and some I have repurchased while others I have decided to try something new! I love the Organix line of haircare products and had already purchased back-ups. Sulfate-free, paraben-free, & cruelty-free while still at drugstore prices. They leave your hair feeling so soft, hydrated, and clean. Plus all the scents smell amazing! The Whish shave cream was a sample from Birchbox. I loved using it and was so sad when it was gone. It was super moisturizing and smelled great. I am definitely considering repurchasing this and other Whish products; however, with the higher price tag for shaving cream I haven't quite made the leap. I discovered the brand Boscia through Birchbox and am so happy I did. It's absolutely my favourite skincare brand. After I ran out of the Purifying Cleansing Gel sample, I right away purchased the full-size. This cleanser is gentle yet powerful enough to easily remove make-up. Only the smallest amount is necessary, so I feel like the higher price is justifiable. I highly recommend this overall brand. I haven't repurchased the Black Mask or the Nightly Hydration. I have been trying out some drugstore alternatives for face masks and moisturizers lately. The Sonia Kashuk Brush Cleanser and the Target Eye Make-up Remover are HG items for me. I have been through several bottles of each of these products and have no real interest to try anything else! I love the spray bottle of the brush cleanser and the inexpensive price tag. The Target Brand Eye Make-up Remover removes waterproof mascara and liquid liner with ease without drying out your skin. It doesn't burn at all (which I have found every other remover to do!) and is very inexpensive as well. I love pore-strips. I am sure I am not the only one... I went through a box of the Rite-Aid brand and have another box ready to go. It was buy one get one free. Usually I buy the Biore ones but these ones were on sale and work basically as well. I do prefer the shape of the Biore ones better. I have been trying to find the perfect moisturizer for my skin. I purchased this one from Burt's Bees and really loved using it. It smells really nice, has a pump applicator, and is from the drugstore. It is lightweight so it's great for under make-up while still being hydrating. Though I really love it, I am currently using a different moisturizer. For some reason my drugstore bumped up the price on this product, so I thought I would try another moisturizer out. 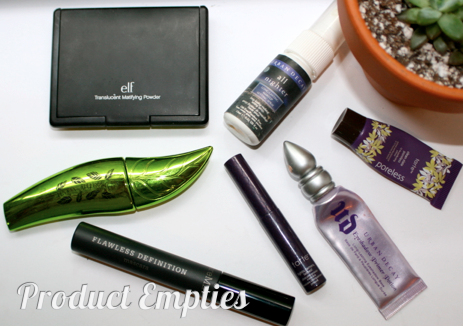 I was needing a new powder when I picked up the elf translucent mattifying powder. For three dollars, it's a great value. It doesn't make you look cakey, and it still keeps you matte. There isn't much product though since half is the powder and half is a little sponge. I wish they would just make the whole compact the powder since I went through this quite fast. I think I am going to try something new, on my wishlist is the BareMinerals Ready powder in translucent. So there are quite a few mascaras in this pile. With a three month expiration date, this tends to be the make-up product that I have to repurchase the most often. I love the packaging of the Physician's Formula mascara, the green leaf is so cute. I love that it's organic (who would ever think of mascara being organic or not?) The brush isn't the kind I typically go for, unlike a lot of people, I am not a big fan of the fat, chunky rubberized wand. I am curious to try other mascaras from Physician's Formula! Next on my list is the pink-tubed 'Fake-Out' one. I love the BareMinerals' mascaras, having tried some others previously. I like mascaras that are lengthening over volumizing, so I have a preference for this wand and formula better. I usually get these mascaras when I purchase BareMinerals sets so hopefully a good value will come along again, so I can have another one of these soon! I picked up this tarte mascara sample as a Sephora perk after having heard so many great things about it. I liked it but it seemed a tad bit dryer which my preference is for 'wetter' mascaras. I don't know if it was just the sample or not. I love the brush and it made my lashes longer and even made it look like I had more lashes which I didn't think was possible. The UD primer potion was my first eyeshadow primer and for a very long time my only. I can't go a day without it! I have repurchased this several times and have a couple of small sizes waiting to be used. I am interested in trying some other popular eyeshadow primers out. I also have a sample of the Nars Pro-Prime I have been trying out and enjoying. Along with eyeshadow primers, I have used up a sample of tarte Poreless primer. I really loved with primer but thirty dollars seems so expensive for the full-size. I have been trying some drugstore alternatives but I might just have to take the plunge. I am interested in trying tarte's other face primers. I don't mind the silicone-like texture, but I would love to try a product without it. The UD All-nighter setting spray is another thirty dollar item, I am not quite ready to repurchase yet. I absolutely loved this stuff though! I went through this travel-size super fast though. I just wanted to use it everyday! I have been seeing several DIY setting spray tutorials and am thinking that might be the route I should take. Who doesn't love the Bath and Body Works 3-wick candles? This month I finished White Barn No. 3 Renew & Refresh. I love this scent for spring. I'm glad I still have the room spray and wallflower refills left, but next time there is a 2 for 22 sale count this one in my basket. While at Target, I stumbled upon this Chesapeake Bay Candle on sale. I love the fresh-sweet scent and thought the size of the jar would be great for using. The scent doesn't permeate as well as the B&BW candles, and it does take a while for it to heat up initially. I really enjoyed this candle and had it lit in my kitchen everyday. What have you gone through over the past few months? What are some products that you repurchase again & again?